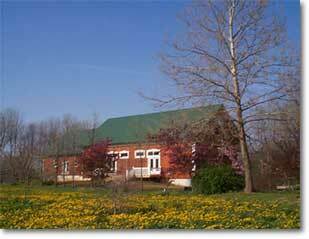 Discover this beautiful jewel in the farmland of central Ohio where one can attend quiet, secluded art retreats. 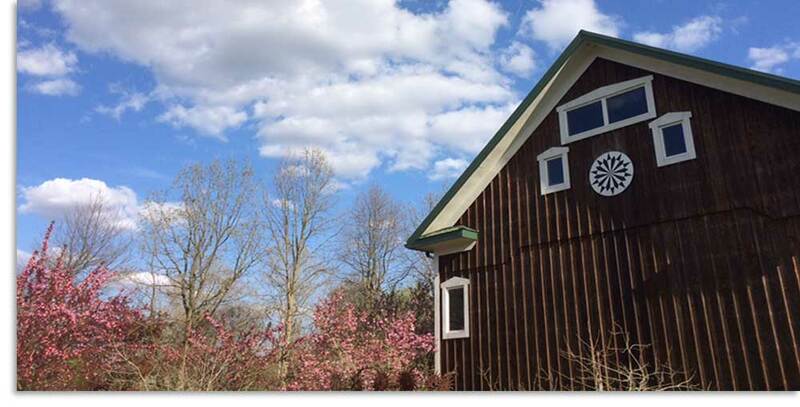 Two-three times a year, the Crow Timber Frame Barn opens for individuals and small groups wanting private art and textile workshops. The retreats take place in the most beautiful months of the year, a time when there are spectacular floral displays and comfortable temperatures; these are the spring months of April/May/June and again in the fall months of September/October. If your dream has been to study with leaders in the fields of contemporary quilt-making, fabric dyeing, composition, color, design, machine-piecing, machine-quilting, fabric and paper collage, shibori, screenprinting, mark-making and surface design on fabric, in superbly outfitted classrooms dedicated to serious art making, then this is the location. (Class levels range from beginning to advanced.) 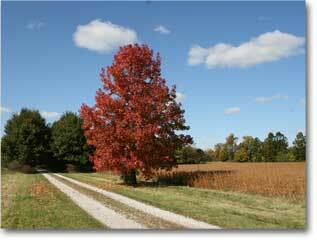 While at the farm, one can absorb the beauty of the surrounding landscape, 100+ acres of trees, fields, pond, and walkways, focused on conservation practices that have elevated the numbers of song birds, assorted creatures and native plants. 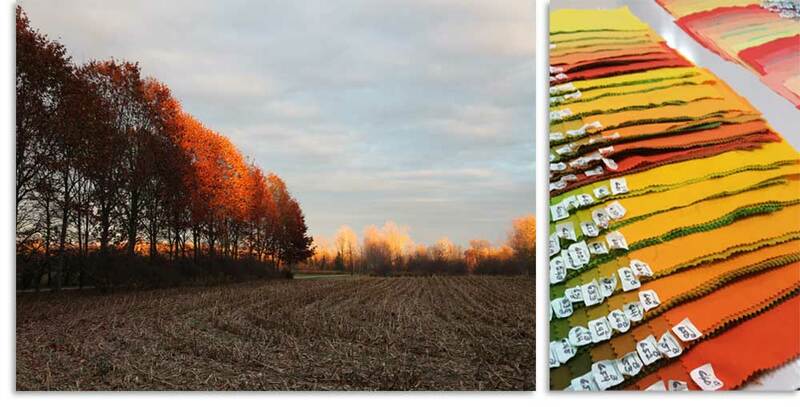 Embrace this opportunity to savor the quietness of the farm, broken only by nature's songs, while learning about composition, color, collage, drawing, printing, sewing techniques, quilting and dyeing. Enjoy the camaraderie of others from all over the world who share similar interests and make lasting friendships. Students have traveled to the Crow Timber Frame Barn for workshops from Australia, Canada, China, Germany, Israel, Japan, Mexico, New Zealand, Scotland, South Africa, Spain, Switzerland, the U.K., Vietnam, and nearly every state in the U.S.
Each student is provided with a large work table, an 8’ x 8’ work wall, and a comfortable chair. Classrooms are well illuminated and are open from early morning until late in the evening, plus the classrooms have air conditioning & heating. The surface design/dye studio at the Crow Timber Frame Barn includes large padded tables, lots of light (natural and color-corrected bulbs), 3 commercial stainless steel sinks, & washer/dryer. Bernina sewing machines are available for rent. Participants are asked to refrain from using cell phones for calls inside the barn. All facilities are non-smoking. 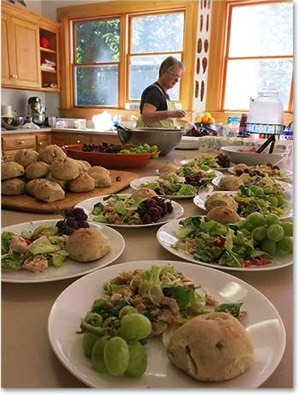 During the workshops, Margaret Wolf chef extraordinaire, will prepare fabulous gourmet lunches and dinners plus daily coffee/pastry breaks during each week of class. The nutritious meals are well-balanced, and since they are prepared, participants have more time to concentrate on their workshop. The gathering for meals also affords the opportunity for informal conversation and relaxation. The Crow Timber Barn is a top notch creative environment with astounding teachers who will levitate you and guide you through a safe creative journey to open your mind to the freedom that allows you to CREATE! 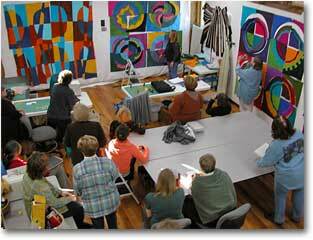 If you’re serious about art you simply can’t go wrong with classes at the Crow Timber Barn. Nancy Crow is an amazing artist and a superb teacher. Be prepared to work, to learn, to tap into your artistic potential - and to have a fabulous time. You can look forward to the camaraderie of like-minded students, delicious meals, and a stunning venue. I’ve taken three classes so far. My art is completely transformed. I can’t wait for what I’ll discover next when I return." "Nancy's workshop was incredibly challenging, consuming, and succeeded in cracking me open to pursue my work with a newfound seriousness and purpose. Nancy not only is serious about teaching the principles of art and how to apply them to your art, but is also serious about challenging you to do your best. 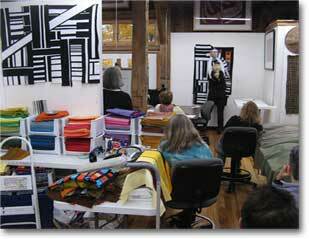 I can't wait to take another class from her at the wonderful Crow Barn." 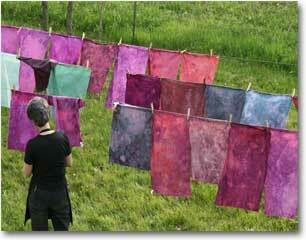 "The first time I walked into the wet studio at the Barn, I thought perhaps I'd died and gone to dyeing heaven. I honestly cannot envision a more suitable place for teaching and learning. It is simply THE best place I have experienced for teaching what I teach. When you add on the spacious design (dry) studio, you can ask for nothing more. Spring or fall, the farm is gorgeous. It is a privilege to be there. Margaret's food has rightly become the stuff of legend on the grapevine, and John and Nathaniel are there to answer all practical needs. Need wood or PVC pipe cut? See the men. The women would do it, but they are all really busy." "I go to the barn to focus on my art making without my usual distractions, like my work schedule, phone calls, emails, shopping for food and dinner preparation, etc. The experience affords me the opportunity to create in an open environment where I am stimulated and excited by a wonderful teacher and artist, Nancy Crow, who challenges me in ways that I can not anticipate. The environment fosters creativity and a community of artists who can share ideas and learn from one another. I have learned a great deal about being an artist from the example provided by Nancy and the others I have met there. It is a very special and fun place to be. I consider it vital to my growth as an artist." "I arrived at the Crow Timber Barn in hopes of turning off my corporate wired brain, truly desperate to access the creative "other" side of my brain. Greeted by a very charming family, surrounded by talented artists, tantalized by extraordinary meals, and truly mesmerized by the master levels of teaching, I was swept into a safe place to search, discover and allow myself to break down the concrete walls I had built in my head. I left the barn bursting with ideas and the ability to continue the creative journey. Fortunately, I now have the experience, notes and exercises to continue down the path of creative discovery with freedom and confidence. The Crow Timber Barn is a top notch creative environment with astounding teachers who will levitate you and guide you through a safe creative journey to open your mind to the freedom that allows you to CREATE! The workshop was the wisest investment in myself that I have ever made. Now I am counting the days until I get the privilege to return once again to this design haven!" "I feel blessed as a teacher each time I return to the Timber Frame Barn. Nothing is better than the coming together of like-minded people from so diverse places, all ready to learn and be inspired in such a beautiful setting. 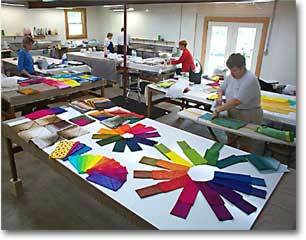 The dyeing and surface design facilities at the Crow Barn are unsurpassed... Tables for wet work and dry work. Sinks, print tables that adjust their height, pinning walls – it's all there. We can work indoors and outdoors, in the early morning or after dinner as the spirit moves. And in such an atmosphere, the spirit does move!" Everything about the Crow Barn underlines the opportunity to step into a space where you can develop your work and take some time for yourself - so leave your laptop and cellphone at the hotel and take advantage of it! The Crow Timber Framed Barn is probably the best textile studio available outside of a university setting - and it beats some of those too. I've never taught or worked anywhere better, it's the model for my own on-going barn-to-studio conversion. The setting is magical: an oasis of beauty and peace that's still within striking distance of retailers, shops and hotels. It's a joy to work in such a sensitively restored building, with light, air, space and all of the facilities one could wish for. Not having to worry about food is heaven as the meal plan means the only thought you have to give to cooking is hearing the lunch/dinner gong! The ability to start early and work late is also a real bonus as it allows independent time to progress work - whether that be engaging in processes or sitting and contemplating. "I've spent 15 weeks at the Barn and they have changed my life! Nancy has sharpened my eye, made me focus, encouraged me to reach farther and never be satisfied with good-enough work. If you're serious about your art, if you're willing to work hard, if you welcome rigorous and honest critique, there is no better place in the world to learn." The 1840s Crow Timber Frame Barn was originally used for storage of hay/feed/straw and for sheltering livestock. The large structure was moved from the neighboring farm in 1997 with renovations beginning in 1998. The Barn opened for workshops in 2001. Tree-lined lane leads to the barn. The Crow Timber Frame Barn art retreats provide an opportunity to focus on one's art without the distractions of daily life. A nurturing, creative environment allows for personal growth and development. The surface design/dye studio at the Crow Timber Frame Barn includes large padded tables, lots of light (natural and color-corrected bulbs), 3 commercial stainless steel sinks, & washer/dryer. 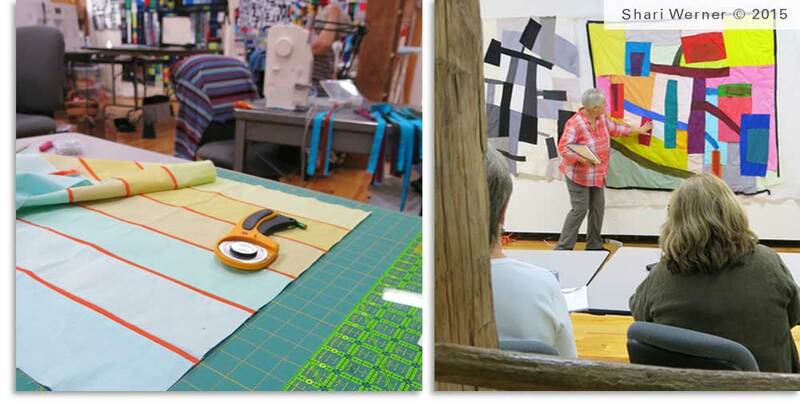 Contemporary quilt making, composition, color, design, machine-piecing, machine-quilting, strip-piecing, art quilt making classes are presented in superbly outfitted classrooms dedicated to serious art making. The professional facilities provide each student with a large work table, an 8’ x 8’ work wall, and a comfortable chair. Classrooms are well illuminated and are open from early morning until late in the evening. 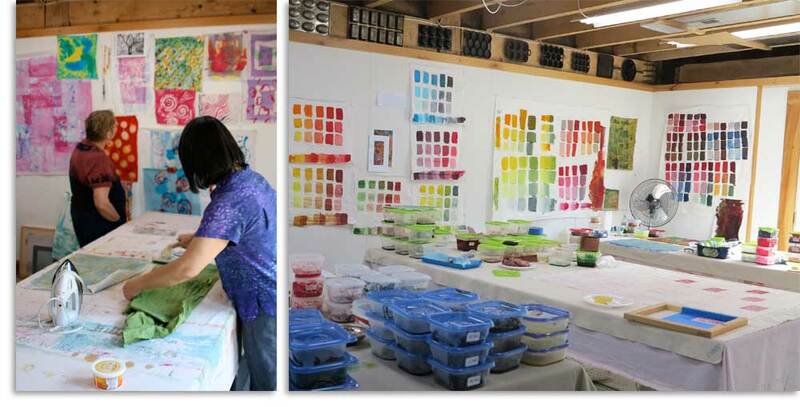 Surface design on fabric, fabric dyeing, fabric and paper collage, shibori, screenprinting, and mark-making are featured workshops offered at the Crow Timber Frame Barn art retreats. Copyright © 2017 Nancy Crow | All images & materials on this site are protected by copyright law.